Approach the awesome sea cliffs at Wilyabrup on foot, following the picturesque Cape to Cape track. Learn a bit about safety, and then take the plunge! Cliff heights vary from 10m to 40m depending on skill and confidence levels. 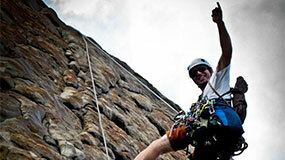 Break for snacks and then turn the day on its head – start at the bottom and conquer the cliff faces. Varying levels of difficulty are available – climbing the sea cliffs and abseiling down again, we promise you an amazing morning on the ropes. Break for lunch and hit the road – travel south to Boranup Forest where you can abseil into a cave, explore crystal rooms and soaring chambers – up to 70m below the forest floor, then climb your way back into the light. All safety equipment and loads of support and fun supplied. Light snacks and refreshments supplied, lunch and special dietary needs can be organised in advance.